One of the Barneys stores got in sorbet Balenciaga flats. They have a very cute traditional look with stitching along the opening of the shoe. Contact Ramiro if interested at 469-221-4814 (if you want his email please leave a comment or email me). Retail is $495. I definitely want something in sorbet whether its a bracelet or a pair of flats! 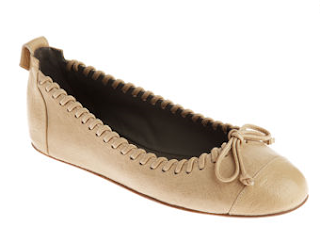 I also found a picture of these flats in Sahara too, they are called "Whipstitch Ballet Flat". Check out the Sahara ones here.